I was just looking out the sunroom window down here in New Smyrna Beach, and saw two little girls, who were probably 4 and 5 years old, running back and forth between the waves and the safety of the beach. I started to cry. Why? It just so reminded me of the days when we took our children to the beach and my girls ran back and forth to the water than back to the beach to escape the incoming wave. 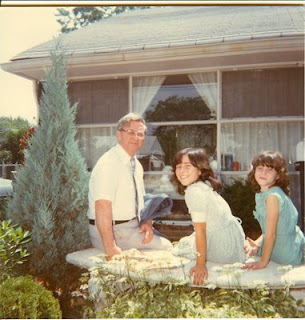 The picture above is my girls, Becky and Cyndi, with their grandfather Hahn. While they aren't in bathing suits, they are about the age of the two little girls I saw on the beach. Where has the time gone? My oldest grandchild is 15 years old. My youngest is already over a month old. Time is just flying by, and I think, where did it go? When my children were young, I wondered, how long will this last -- taking all the paraphernalia needed to enjoy a day at the beach with three young children? When will they be grown up enough to get their own lunch? How much longer until they can do their own laundry? That,by the way, was one of the first things I taught them. As soon as they could reach the top of the washing machine in order to open the lid, they learned how to do their own laundry. And I didn't keep in my mind and heart all the good times we had when they were young. We did have good times. We went to the beach almost every year when they were young. 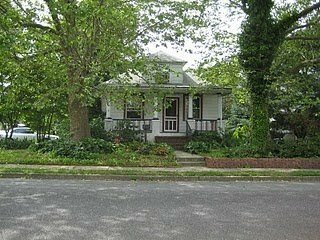 My husband's aunt lived in Lewes, Delaware, one-half block from the beach. Granted it wasn't the ocean, but we always managed to spend at least one day at the Rehoboth Beach State Park and that satisfied my desire to be at the beach in the summer. When I was growing up in Runnemede, it was about a two-hour drive to any one of the Jersey Shore beaches --back in the 40s and 50s. Then the state put in the Alantic City Expressway, and the drive was cut to 45 minutes max. I spent summers as a teenager at either Ocean City or Whale Beach. Whale Beach was washed away during a northeaster in the early 60s. Then it was strictly Ocean City (New Jersey) as my beach of choice. So, I think I've waxed nostalgic long enough. I just had to get out of my weepy mood and now I'm going back to watching those little girls playing on the beach. It does go too fast. I agree completely. It has gone too quickly for me from the beginning, though- I was always aware that the time I had with my kids was fleeting and it makes me cry, too. That river just flows so swiftly and there's no stopping it, no, nor slowing it. So, I've tried from the beginning to be in that river with them for as long as it is allowed me. It's been a beautiful journey so far, but that wretched nostalgia is why I don't go through my pictures very often. It just hurts too bad- they're too big to carry now.